AMTA Wisconsin Chapter Government Relations Committee is here to help with questions or issues relating to how our profession is impacted by laws: Government, State and Municipal. We work with the American Massage Therapy Association (AMTA) Governance team on your behalf. The National AMTA office provides us with monthly reports on legislation across the country. We also retain a Legislative Watch to alert us to current and upcoming legislation. When a call to action is needed we alert the membership, often early enough in a bill's process to prevent poor or damaging legislation from moving out of the committee stage. Watch our website, social media, Connecting Hands Newsletter, and chapter member news emails for alerts. Non-Members may also subscribe for legislative alerts by email (see below). We may also post action alerts on Engage, AMTA’s new legislative advocacy action tool. 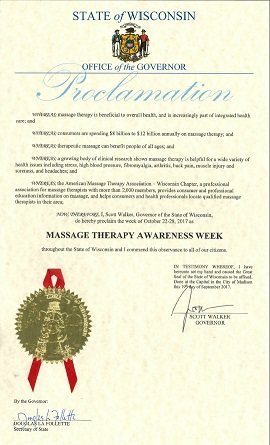 Each year, we also request a Proclamation from the Office of the Governor declaring Massage Therapy Awareness Week in Wisconsin to coincide with AMTA's National Massage Therapy Awareness Week. Monitoring and addressing all proposed legislation for potential impact on the massage and health industry, including:. Our member-driven proposed legislation. Related to scope of practice, establishment regulations, enforcement of unlicensed practitioners. Introduced as 2017 Assembly Bill 899 Bill did not complete the legislative session ending spring 2018. We anticipate starting the process again for next session. Please click the orange link above to learn more, including how you can help now. Oppose AB 369/SB 288 which proposes an Occupational License Review Board which will recommend occupational licenses and their respective continuing education requirements to be eliminated. Current status, Has not left Assembly committee, Passed Senate Committee and eligible for Senate vote, as of 2/2/18 Senate vote not currently scheduled and unlikely to be scheduled. We anticipate the bill to die at end of current session, but we will monitor to see if appears again. You may follow this bill here. Clearinghouse Rule CR 17-084 which creates avenue for LMTs to receive referrals from veterinarians to provide animal massage, and clarifies that animal owners may opt for an unlicensed animal massage practitioner to provide services for their animal. Info here. For legislative updates, calls to action on pending legislation, & news delivered to you inbox, sign up here. For links to State laws on Massage Therapy click here. For a list of local establishment regulations we are aware of click here. WI Department of Revenue Massage Therapy Sales and Use Tax Fact Sheet (PDF) may be downloaded from the state here. To contact the current Government Relations Chair, please click the "Contact" link on the upper right hand of this page, and select Government Relations, Law, & Legislation before you send your message. If you value the legislative monitoring and action provided by AMTA-WI Chapter, consider a contribution. Contributions may be tax deductible as a regular business expense, please consult your tax specialist. For current news, click here.